By analysing measurements from the Infrared Atmospheric Sounding Interferometer (IASI), a French-Belgian team has compiled the first global map of ammonia emissions with a resolution of one kilometre. The team identified 248 hotspots, 85% of them originating from intensive livestock farming and industrial nitrogen fertilizer plants. Their results were published on 5 December 2018 in the journal Nature. Nine-year-average global map of ammonia measured by IASI (2008-2016). Black circles mark the 248 identified point sources. An interactive version can be viewed on the Université Libre de Bruxelles (ULB) website. Credits: M. Van Damme and L. Clarisse / ULB. 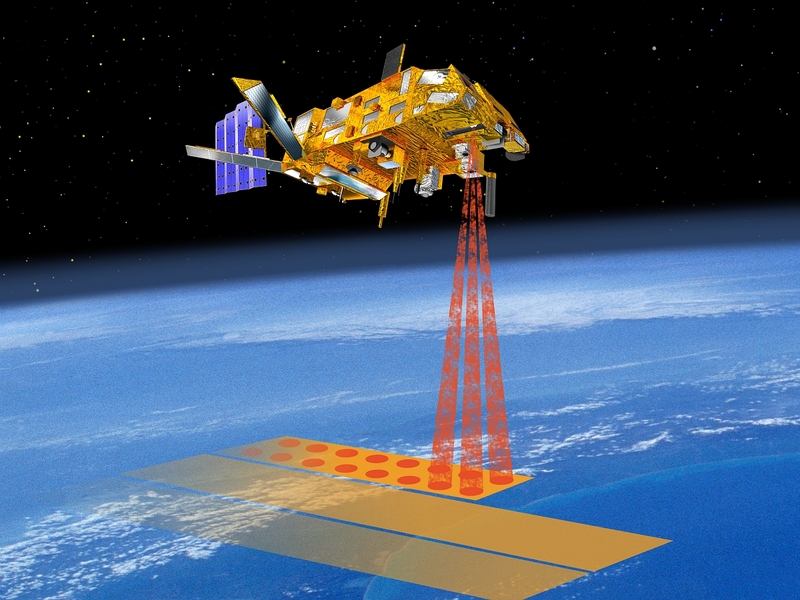 Developed by CNES, the IASI infrared sounding instrument wasn’t originally designed to measure levels of ammonia from space. “Initially, we didn’t believe the instrument would be able to detect ammonia, since its absorption signal in the infrared is extremely weak. And once emitted, ammonia only persists in the atmosphere for a few hours. But the series of measurements accumulated enabled us in 2008 to isolate the signature of ammonia from the instrument’s background noise, and then increase the precision of observations by averaging over several years,” explains Cathy Clerbaux, research director at the LATMOS atmospheres, environments and space observations laboratory, attached to the French national scientific research centre CNRS. Ten years later, a new milestone has been reached with the publication of the first global map of ammonia at a resolution of one kilometre. To achieve such high spatial resolution, the research team used an oversampling method on the data collected between 2008 and 2016 by the IASI instrument on the European Metop-A weather satellite. The IASI instrument is on three polar-orbiting satellites: Metop-A, Metop-B and Metop-C, launched in 2006, 2012 and 2018. Credits: CNES/REGY Michel, 2018. Measurements from IASI on Metop-A on 20 and 21 July 2016 over Northern Italy. Each ellipse covers a surface area of 113 to 612 sq.km. Using the slight shift of the satellite’s track on each orbital revolution combined with an oversampling method, the research team was able to refine the spatial resolution down to 1 kilometre. Credits: M. Van Damme and L. Clarisse, ULB (IASI) / Google Earth and Landsat / Copernicus in Nature. This high spatial resolution allowed the team to identify 248 point sources of ammonia (with diameters smaller than 50 kilometres), two-thirds of which had previously gone undetected. With the exception of one natural source in Tanzania, all the hotspots originated from anthropogenic sources, mostly production of fertilizer and intensive farming. Ammonia (NH3) is a chemical compound emitted from livestock excrement and nitrogen crop fertilizers. Of the 248 identified emission hotspots, 130 coincide with chemical fertilizer production facilities and 83 with intensive livestock farms. “Many cattle feedlots and pig farms with huge open waste pits were identified in Central and North America, for example. In South America, intensive poultry farms proved to be big sources of ammonia,” notes Martin Van Damme, a researcher at the Université Libre de Bruxelles (ULB) and lead author of the article published on 5 December 2018 in the journal Nature. Large areas of ammonia emissions are also identified, the most extensive being the Ganges Valley. This region, which covers Pakistan and Northern India, combines intensive livestock and crop farming, domestic fires and burning of stubble, weeds and waste, and numerous fertilizer plants. In West Africa, high levels of emissions come from biomass burning and slash-and-burn agriculture. In Europe, the Po and Ebro valleys stand out in particular. Ammonia emissions over an intensive poultry farm in Peru. Credits: M. Van Damme and L. Clarisse, ULB (IASI) / Google Earth / DigitalGlobe in Nature. Top: ammonia emissions measured by IASI between 2008 and 2016 above a point source in China. 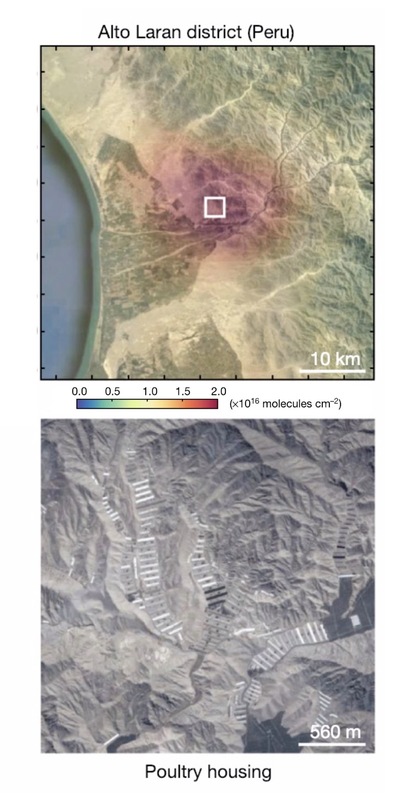 Bottom: images acquired by the Landsat satellites showing the construction and commissioning of a nitrogen fertilizer production facility. Credits: M. Van Damme and L. Clarisse, ULB (IASI) / Google, NASA (Landsat). Besides locating new sources of ammonia emissions, the IASI data show that levels are greatly underestimated. We found emissions up to 500 times higher than those recorded in the inventories commonly used by scientists. “Cadastral maps are not very precise and monitoring this species systematically on a global scale is hard to do. Moreover, we have no local measurements from many regions of the world where ammonia emissions aren’t regulated. So observing ammonia emissions from space can help us to record and monitor them more accurately,” says Cathy Clerbaux, co-author of the article. Ammonia is an atmospheric pollutant that plays a key role in the formation of fine particulate matter (PM 2.5, smaller than 2.5 micrometres in diameter), which is the most dangerous to health as it penetrates deep into the respiratory tract. “Excess ammonia in the environment is also contributing to acidification and eutrophication of ecosystems, and thus reducing biodiversity,” stresses Martin Van Damme. Industrial and agricultural ammonia point sources exposed. Van Damme, M., Clarisse, L., Whitburn, S., Hadji-Lazaro, J., Hurtmans, D., Clerbaux, C., Coheur, P.-F. Nature, le 5 décembre 2018. DOI: 10.1038/s41586-018-0747-1.